Annika Sorenstam is aiming to finish her illustrious career on a high with a perfect three-peat at this week’s Dubai Ladies Masters, her last competitive event before she steps away from the game. A hat-trick of titles in Dubai would be a perfect farewell gift for Sorenstam whose glittering career, spanning 15 years, is studded with 89 professional victories, including 10 major championships. The first player in the history of the game to cross the $22 million mark in earnings, Sorenstam however, knows how difficult it is to win a tournament three times in a row. After all, she's done it twice. "It is quite tough. My approach will be to try not to think about it," said Sorenstam ahead of starting her pursuit of a third straight title in the Dubai Ladies Masters which will be played on the Majlis Course at Emirates Golf Club from December 11-14. "I don't want to put more pressure on myself than I need to," said Sorenstam, who shot a sizzling 18-under-par 270 to take the inaugural edition by a staggering six shots ahead of fellow Swede Helen Alfredsson in 2006. Last year she held off a strong challenge from Denmark’s Iben Tinning to retain her title by two shots with a total of 10-under-par. 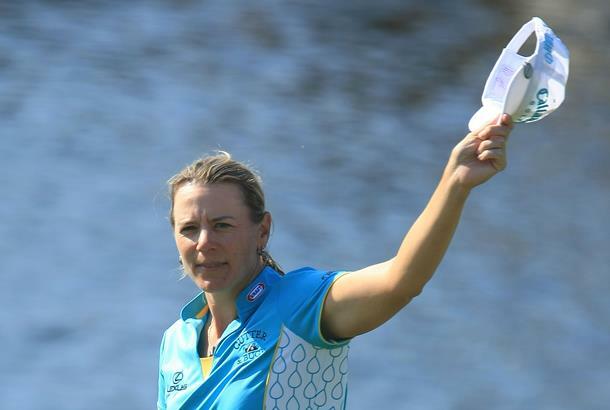 “I think it’s going to be a very emotional tournament,” said Sorenstam who has won three titles on the LPGA Tour this season and once on the LET, at the Suzhou Taihu Ladies Open in China. “First of all, I love Dubai. When I went there two years ago I didn’t know what to expect but I just loved it. They took very good care of us, a great golf course, the hospitality and the country itself is just so unique and so special,” said the 38-year-old former World No 1. “I have other priorities in my life, I have a lot of dreams," said Sorenstam, who will be getting married to partner Mike McGee a month after the Dubai Ladies Masters and would like to spend more time building the Annika brand which includes her golf academy and golf course architecture firm. However she may make a comeback in the future, should she feel the urge.